So unique and SWEET! Our Chocolate Cross Pretzel Rods will make the perfect Party Favor for First Holy Communions, Confirmations, Baptism or Christenings! Each Chocolate Dipped Cross Pretzel Rod comes in cellophane and a colorful ribbon! You can choose from the traditional Chocolate Dipped, or get a little fancy with White Chocolate Dipped, Pink Chocolate, or Blue Chocolate! 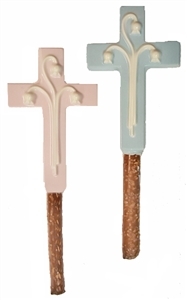 These beautifully detailed molded Cross Pretzel Pops measure a large 8" and will definitely be a hit at your party! Each pretzel is individually wrapped and tied with a coordinating curling ribbon. The cross measures 4" x 3"